Beautiful finish! Great value for the $. Looks wonderful! Experience Kraus Quality with classic stainless-steel sinks that will look great in both traditional and modern kitchens. The Premier series features easy-to-clean rounded corners and a wear-resistant finish that will stand up to your toughest kitchen tasks. Dimensions 32.0 In. X 20.63 In. X 9.0 In. I'm an interior designer and I specify a LOT of high-end kitchen products. I would recommend this brand of sink to everyone (and I have). 16 gauge stainless is hard to find, even in the most expensive brands - in the world - and the extras included with the sink (i.e. protective bottom grates, strainer baskets, and flanges) are worth so much. This is the most incredible sink and not just because it is so reasonably priced. Period. It's the only brand of stainless steel sink I purchase, whenever the style is right. This is a good looking quality sink with insulation underneath. Haven't used it enough to really tell the quality. After using the Kraus kitchen sink for almost three months, I am very satisfied. They are sturdy, they remain lustrous and easy to keep that way, and the grids that accompanied the sink are great. The sink looks very nice with our new earthtones granite countertop. Everyone thinks that the sinks and the Krauss faucet are top quality. Kraus even included extra rubber tips for the grids. Kraus also packs the sink and attachments very securely. This was one of my first purchases from Overstock. i will be a returning customer. This sink is perfect ~ solid construction and very classy looking. I love the metal sink protectors that came with it. Just completes the look. The towel also helps with wipe down after use to keep the "new" appearance of the stainless steel. I love it. This is a great sink! I am so glad I purchased it! 9 inches is deeper than you think (so is 7inches). It is a large sink and deep enough for just about anything you need to clean. I have not had any problem with scratching. I really like the grates at the bottom. It seems to help keep water flowing, and looks really nice. I highly recommend this item. I was shopping for sinks at the local "depot" level and couldn't find exactly what I wanted and they were expensive. Found this sink, heavier SS nice looking and it came with extras at HALF the price. 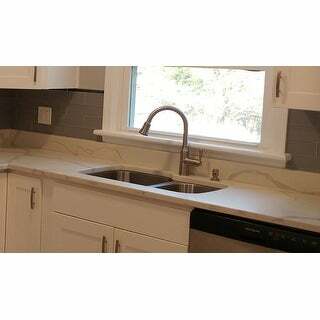 Pros, nice quality drain assemblies included, nice looking finish.quiet sink. Cons, no template included in box so it was more work for the granite guy to cut the sink hole. Love the sink strainer basket, it's cute an super functional, much better than a run-of-the-mill sink strainer. FAST shipping, well packed, even had a fancy bag that I don't know what to do with- it's too nice to toss. The padding on the outside of the sink makes me think I got a new disposal, it is so much quieter. The baskets were perfect, and sealed easily. Easy install. I just received the Kraus-32-inch under-mount sink. We were a little afraid about making a purchase like this online, but after reading the other reviews about the sink we went ahead with it. We were not disappointed. It's a great-heavy gauge sink that looks beautiful. Very glad we made this purchase. Love it! Looks fantastic with my new granite counter tops. Strong, won't dent, came with all the hardware and they even threw in a kitchen towel. The sink was exactly what I wanted and looks beautiful in my new kitchen. My husband was not pleased with the items for the drain openings because they had some plastic pards so we used our old ones. Other than that it has met all my needs. This undermount comes with the grates to protect the bottom of the sink from scratches and a towel to wipe it dry after use. Try to be careful with unpacking so you don't lose the small plastic feet that come with the grates. I accidently lost one and have no ideal how to replace. love my Kraus sink!!! 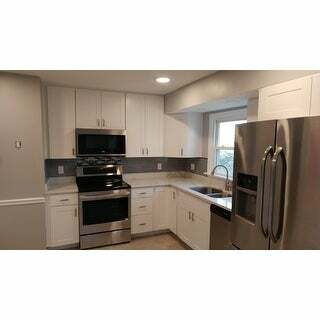 - Doing a complete remodel in our kitchen, I have researched every item going into the kitchen thoroughly checking many websites for customer reviews. This one got great reviews and after seeing and using it first hand, I couldn't agree more. Love the fact that racks for both sinks protecting the bottom from scratching are included in the price. It also came with a black towel for wiping it down which I haven't used. I highly recommend it. No one thing I can say negative. You can't go wrong if you want this particular size. I was very pleased with this purchase as the quality of the sink was excellent. The contractor who was remodeling my kitchen thought it was one of the best sinks he has seen for the money. I appreciate that it came with accessories that usually cost extra. I highly recommend this sink. 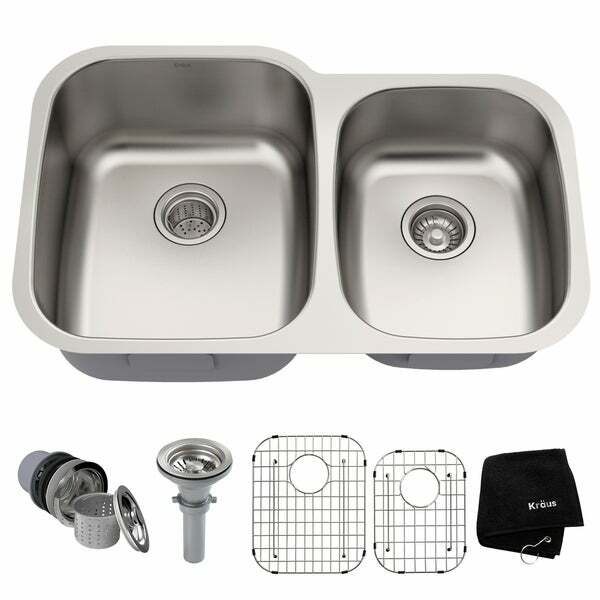 I absolutely love this stainless steel sink and all the supplies it comes with is great! It comes in a beautiful black bag with the sink in it, so elegant and beautiful! 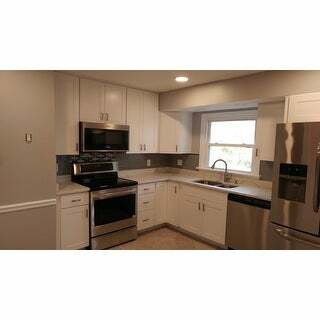 My contractor stated that it was easy to install and hook up and looks absolutely beautiful! You can definitely tell it's quality steel and materials! I absolutely love it! We've had this installed for three months, and it's fabulous. No tinny noise when the water runs. We only keep the grid in the small sink as it gets in the way of cleaning, and utensils get stuck under it. We ended up using the fiter in our laundry room sink since we have a garbage disposal, but it's great that it comes with all the accessories. 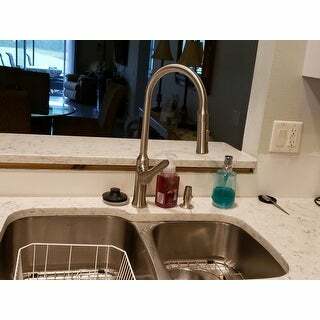 Our countertop installer was impressed with it, and thought what we paid for it was less than he would sell it for. High quality sink and love that both sinks are large enough to wash anything I need to wash in the sink. Just what I wanted. Perfect. I like the sink grates it comes with. An excellent stainless steel sink at a reasonable price! This looks absolutely perfect!! Just what I wanted. We’re in the building process so we haven’t installed it just yet. I’ll update with pictures once it’s all in. This is a good looking and durable stainless sink. It comes with sturdy raised ,steel drain baskets, and all necessary drains and stoppers. Excellent quality!!! "Does this sink come with a faucet. Or is there a compatible one?" This sink model can go with any faucet of your choice. No. Faucet not included. Fabulous sink. The current price for this is a real bargain. Best sink I've ever purchased. "What is the warranty on the faucet. The one that came with my sink is leaking profusely as if the gaskets need to be replaced." This item is the sink only. You may want to check with the manufacturer of your faucet. If it's Kraus, you could probably get the information from their website. "Are the racks (screens) and the drains and baskets all included with the purchase of the KBU24 sink"
​This item comes with the grids and drains. "The sink dimensions are very unclear. What are the inside lengths (left to right) widths (front to back) and depths of each bowl? Thanks." "Are the bowls on this sink of equal size? I have looked at other websites and this model number they show the bowls equal but your pictures look like it's a 60/40 configuration. I'm trying to figure out what is the difference in the KB22 and the KB24." This sink has a 60/40 split. The left side is larger and deeper. "My cabinet is 32 1/2 ". Will this sink fit in that space?" Hello Margie, the sink requires a 33 inch cabinet. Thank you for shopping with us. "The specs say this sink has rear drains. Does that mean I'll need to re-plumb when replacing my current center drain? Or is there a center drain model of this sink?" Hello LindaLou, most Kraus Stainless steel kitchen sinks are rear set drains. For plumbing set-up inquiries. Please consult with a licensed plumber. Thank you for shopping with us!